Posted November 19, 2015 by Heather Michet & filed under Healing. Sophie is my dear rancher friend in Montana. She’s been struggling: her 170 calves were having a really rough go during their post-weaning time this year. The calves are super stressed during this adjustment period due to the separation from their mothers, the change to different food (no more udders around) and the variable winter weather. With the stress comes lower immunity and therefore greater susceptibility to illness and possibly death. Medicines prescribed or suggested by the veterinarian are really expensive and not conveniently found at the corner drugstore, mostly because there is no corner drugstore or even a corner: the ranch is 56 miles from town. Sophie and her husband love their animals and prefer to let the calves’ systems adjust and strengthen naturally through the weaning time vs. administering loads of meds. When needed, medicine is used sparingly. 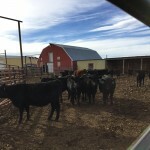 With temperatures fluctuating between 20 and 40 degrees F and high winds howling over the prairie, Sophie had many calves getting sick this year, more than she’s ever had in her 20 ranching years. She doctored the most severe cases, one died, and others were heading in that direction. She ran out of medicine. The temperature turned super cold and the wind was blowing at 80 mph. 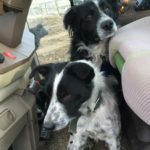 Her husband was away hunting; it was only her, their ranch helper, and some great Border Collies to do all of the calf tending and other ranch work. As I listened to her sharing this nightmare the other night, I told her: “I will send Reiki to you, the calves, and the ranch.” “Oh, that’s perfect and just what I need!”, she replied. Over the next couple days, I did just that. I sent Reiki* to those calves, with some extra juice directed to one in particular who was very sick. Then I received this video from her yesterday. Have a look to see what happened.